Join us for Family Day presented in conjunction with the exhibition “Anna Craycroft: Motion into Being,” on view at the New Museum from January 17 to May 13, 2018. Families will physically enter the stage where Anna Craycroft shoots new footage every week for the animated film in her exhibition, presented in the Fifth Floor Gallery. Craycroft draws on traditions of folklore and fables, which often attribute human characteristics to objects and animals to narrate moral tales. 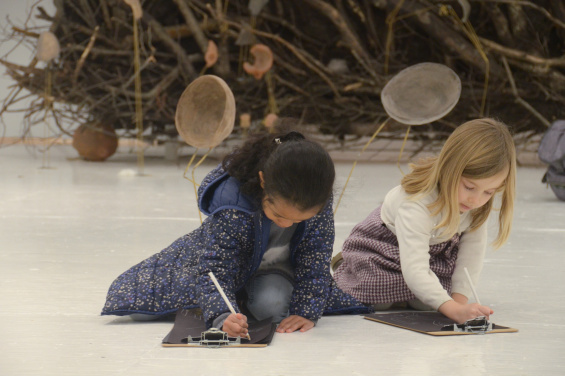 In the Sky Room, families will make their own characters with clay and found objects, place them in a landscape, and bring them to life by creating stop-motion animations. Support for “Anna Craycroft: Motion into Being” can be viewed here. Additional support is provided by the Mimi Saltzman Foundation and the May and Samuel Rudin Family Foundation.